Modern Westerners take it for granted that every life is valuable. But ideas like equality before the law and the importance of caring for the vulnerable are by no means self-evident. So where did they come from? Why are we so attached to the idea of “inalienable human rights”? This segment looks at the part that Christianity played in the history of slavery in America … for better, and for worse. SIMON SMART: Scattered across the southern states of America are the remains of breath-taking estates, monuments to a powerful and genteel society that fed on the blood and tears of a slave class. It was on plantations like Oak Alley in Louisiana, that African American slaves endured a system of brutality and cruelty that’s barely comprehensible, to support a degree of luxury some considered to be their birth-right. 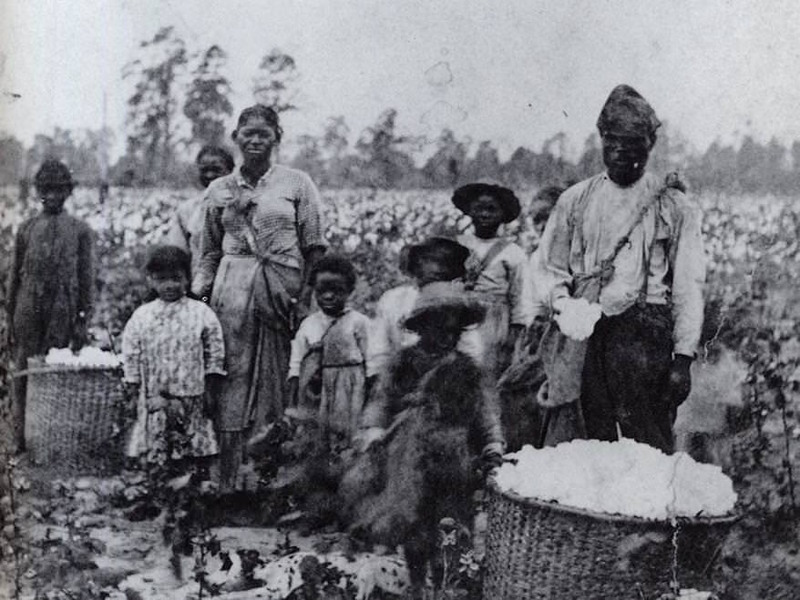 Slavery was the foundation of American wealth, especially in the South. And the prosperity of these regions was closely linked to mass-market cash-crops like sugarcane, cotton, and tobacco. But these were extremely labour-intensive. Slavery enabled the settlers to harvest the wealth of their new nation. And all it took was a tweaking of their consciences and some twisting of their Christian beliefs. ALBERT J. RABOTEAU: It’s true that Christianity was used as a weapon to justify the enslavement of African people. Christianity over the centuries has been used by many people to justify acts that are very unchristian. SIMON SMART: The Africans were regarded as property – without any more rights than a chair. In practice, this meant that they could be beaten by their owners and forced into backbreaking work. Take a moment to imagine living like this. Going out to the fields every day, and returning to this one, dark room every night. Your entire family lives here, but you don’t even have control over your own bodies. Any one of you can be sold off at any time. Do you have a sister, or a daughter? 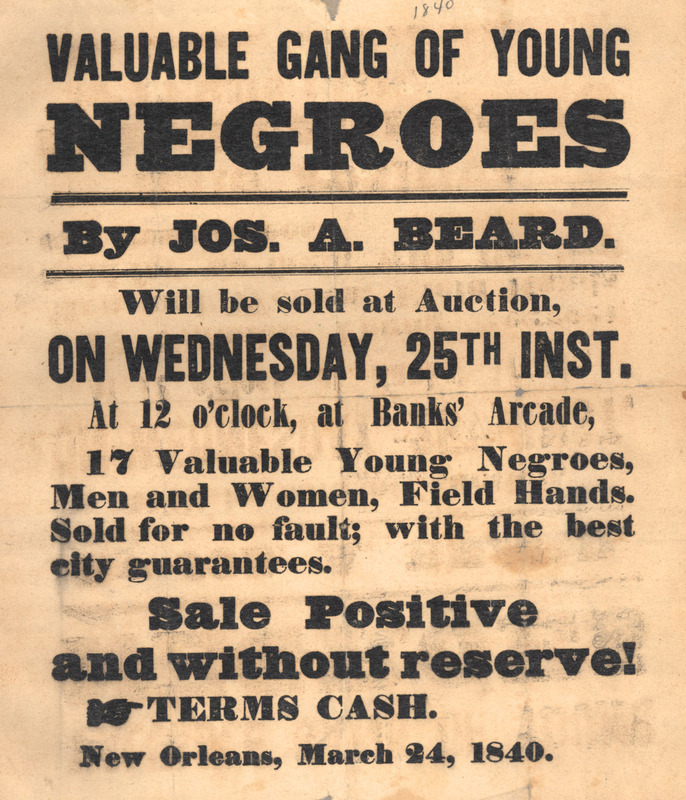 Slave owners often sold off young girls to be the breeders of the next generation of slaves. Enslaved people weren’t just physically defenceless, they were emotionally vulnerable as well. Slaves were denied any legal right that might confuse their status as property. They couldn’t marry; they weren’t allowed to learn to read; they essentially couldn’t harbour any ambition for a future. Slave owners employed a range of means to assert control, including legislation and violence. They also used religion. Christianity – a message about being set free – was used as a justification for enslaving African people. White plantation owners read the Bible in a highly selective and, frankly, warped way. They plucked at verses to justify not only owning other human beings, but treating them no better – and in some cases, far worse – than their farm animals. They emphasised passages that called on servants to obey their masters while conveniently neglecting the Bible’s radical insistence that all people were made in the image of God and equally precious in His sight. That those responsible for such systematic cruelty could claim to be followers of Jesus, and even use Christian teaching to justify enslaving others, is truly hard to fathom. And you’d think that anyone suffering under this system would reject such a faith out of hand. And yet, that’s not what happened. CATHERINE BREKUS: So, enslaved people heard a lot of sermons about “Slaves, be obedient to your masters”, but they also heard the stories about Moses leading people to freedom, and they loved those stories, and they internalised those stories, and they were certain that that would eventually be their story. 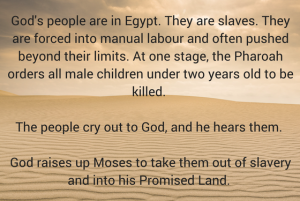 That there would be a Moses who would lead them to freedom. That Jesus would not let them suffer forever. ALBERT J. RABOTEAU: That basis within Christianity for seeing every person as a child of God, as made in the image and likeness of God, was certainly a lesson that was extremely important for the slaves to repeat among themselves. SIMON SMART: Secretly reading the Bible confirmed what they’d suspected: slavery was wrong, and God was a God of justice who would judge their white oppressors. By the early 19th century whites were joining the abolitionist movement for the same reasons – believing that divine justice was coming for an unjust system. America needed to repent of the national sin of slavery. ALBERT J. RABOTEAU: The abolitionist movement was a very important movement and an indicator of the fact that many whites were troubled by slavery. In part, they were troubled because they began to read slave narratives – that is, the accounts of former slaves who had escaped from slavery, such as Frederick Douglass’ – and they realised that this was antithetical both to Christianity and to the claims of what America was about. 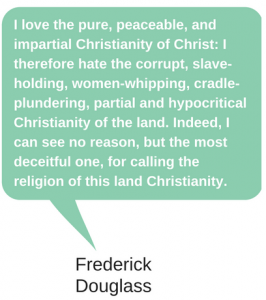 ACTOR (FREDERICK DOUGLASS): I love the pure, peaceable, and impartial Christianity of Christ. I therefore hate the corrupt, slave-holding, woman-whipping, cradle-plundering, partial and hypocritical Christianity of the land. Indeed, I can see no reason for calling the religion of this land Christianity. I look upon it as the climax of all misnomers, the boldest of frauds, and the grossest of libels. I am filled with unutterable loathing when I contemplate the religious pomp and show which everywhere surrounds me. SIMON SMART: In 1852, Harriet Beecher Stowe, a deeply religious woman, published Uncle Tom’s Cabin, the best-selling novel of the 19th century. It gave many people their first real view of slavery, and sent shockwaves through American society. ACTOR (HARRIET BEECHER STOWE): A slave warehouse! There you’ll find an abundance of husbands and wives, brothers and sisters, fathers and mothers, and small children, to be sold separately, or in lots to suit the convenience of the purchaser. And that immortal soul can be sold, leased, mortgaged, exchanged for groceries or dry goods, to suit the phases of trade, or the fancy of the purchaser. CATHERINE BREKUS: Uncle Tom’s Cabin was the bestselling book in America before the Civil War with the exception of the Bible. The Bible is the only book that sold more copies. And it’s clear that Stowe reached a lot of people through her story and that she galvanised a lot of anti-slavery sentiment. SIMON SMART: The Bible was a key player in this whole story – for better, and certainly for worse. Abolitionists used it to oppose slavery; slave-owners used it too. It’s one of the clearest examples in history of how faith can be twisted to justify our worst behaviour. SAMUEL MOYN: While Christians did a lot to introduce the idea of the equality of all individuals, they also did a lot to obstruct the progress of that idea. JOEL EDWARDS: The disappointing thing, the painful thing, but the real thing about Christian history is that even though we have aspired to this idea of living in God’s image, we often fail, palpably. Plot where you think Christianity falls on the scale between oppression and freedom. Create a PowerPoint slide with three words, three images, and three emojis that describe the word “slavery”. Explain your choices. What observations can you make about the following images of slavery in the United States in the 1800s? What is your reaction to these images? Listen to the song “Queen of the Field” by Alicia Keys, and read the lyrics. What further insights does this give you about the experience of slavery in the United States? Imagine you are one of the people depicted or described in the above images or song. What would you like to say to your master? Draw or find an image to contrast the experiences of slaves on plantations in the United States, and the plantation owners. Make a list of some of the basic rights and freedoms that were denied to slaves. How was the Bible misused by the slave masters to justify their actions? How did the slaves respond to Christianity? Why might this have been unexpected? The Biblical idea that every person is made in the “image of God” means that every person has inherent equality and dignity. How did this idea inspire the slaves in America? What evidence is there that slave owners ignored this idea? In your own words, write a one-sentence summary of the following quote from Frederick Douglass. 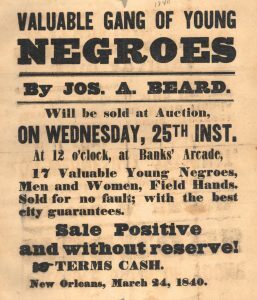 In Uncle Tom’s Cabin, Harriet Beecher Stowe writes about a slave warehouse where husbands, wives, brothers, sisters, fathers, mothers, and young children could be sold separately. Explain why this was an especially cruel part of the system of slavery. 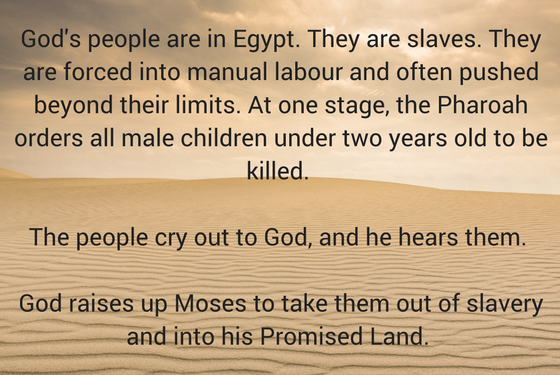 Read the following summary of the Biblical story of the Exodus. What might this story reveal about the character of God? 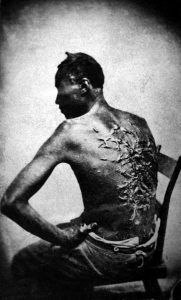 Why do you think slaves in America were inspired and strengthened by this story? referenced in this passage, and the slave owners? What is your reaction to the words of judgment in this passage? When it comes to the brutal practice of slavery, do you think this judgment is justified? Create an anti-slavery poster based on these verses. Write a letter to a “Christian” slave owner in the 1800s in America’s South that challenges their practices. Use one or all of the Bible passages from this lesson. Considering the argument that Jesus was concerned first with individual change, not with social revolution, and that just a few Christians could not overthrow the entire Roman system of slavery, read Colossians 3:22-4:1 and discuss whether this billboard accurately represents the meaning of the passage. Design your own billboard that responds to this billboard, drawing on a Bible passage referenced in this lesson. Look at this infographic about modern slavery. List some modern examples of slavery and/or oppression, both in Australia and globally. Brainstorm some steps our government could take to fight modern slavery.